Extend your Internet connection - Extend a wired broadband Internet connection to any electrical outlet in the home. Perfect for desktop PCs, gaming consoles and set-top boxes. NETGEAR Green features - Automatically powers down and turns off LEDs when not in use; less than 1 Watt in stand-by mode; packaging made from 80% recycled material. Pros: It works as advertised. Doesn't completely block top wall plug when used in the bottom. Cons: It's not very small - while not annoyingly "noticeable", it protrudes quite a ways off the wall. Since it sits pretty far off the wall, and it's not super lightweight, if you plug it into the bottom outlet it tends to "sag" towards the wall. Functionally not a problem, but it just looks less professional. Other Thoughts: Overall I would definitely recommend this. I use it as an wired connection for my Xbox360 in my living room, which is 40+ft from my wireless router. Because it goes through so many walls and a floor the connectivity is spotty in that room for all devices. Trying to use streaming services or any games wouldn't be very seamless - but is very good with this powerline kit. I have the first one plugged into the service outlet directly under my power panel (my modem/router are located relatively close to this). No interference that I can tell, and they synced up without any issues. I'm tempted to give it 4 eggs, but for what its intended use it does exactly what I need. The cosmetic issues are minor...but would have been awesome to have it be slightly less large and more bulky/heavy. I understand this is probably mostly to do with being able to plug another device into this one(so as not to completely lose the outlet). Other Thoughts: These aren't the fastest powerline adapters you can buy, but they were super cheap and with my slow Internet they work just fine. Pros: This is a first week impression. I bought these because my wireless gateway is downstairs and my laptop upstairs in my office is on the opposite side of the house, connected via wifi. I have a 12Mb Uverse internet connection and usually get about 5-6mbs on speedtest through my wireless connection in my office. Plugged these in (literally took me 30 seconds) and now I consistently, everytime, get my full 12Mb speedtest from my laptop in my office. I live in a house built in the 70's so I was skeptical about the wall wiring, panel, etc. but it "just works". Even have it plugged into a power strip in my office and Internet speeds couldn't be better. I realize people do their technical speed tests as to whether they really give 200Mbps speed, but I'm telling you they easily max out my 12Mb internet connection and that is all I care about. Cons: None so far. Ethernet cord that comes with them is only about 5 feet so you may need longer. Other Thoughts: Bought these when Newegg had them on sale for $30 a piece. Will buy a set for every room in the house next time they are on sale. Pros: Really easy setup, it took me less than 30 seconds to make it work. No need to drill walls with this. Even if I do not own it for a longer period. There has no been connection dropout which is a real good thing. I use the adapter to plug my Wi-Fi router. From that, my Playstation 3 and a TV receiver are plugged in, where I am able to get ~15 mbs of my 25 mbs internet speed. Before with Wi-Fi I used to get less than 4-5 mbs. Which makes me really satisfied with the results since I have never owned a Netgear product in the past. Cons: As stated before by other owners, the only cons that I see about this unit is that you cannot plug a three-pong power cord into the outlet but only two-prong power cord. But since I got it on rebate, I don't complain too much about it. Other Thoughts: Got it on rebate. I gave it 5 stars even I i do not own it for a longer period, I will modify my rating in the future if I see any changes on it. Other Thoughts: Package came without installation CD. Downloaded software from NewEgg site, but software did not recognise any of the adapters. However they seem worked without the software. "Worked" means they provided laughable speed but did not break the connection. Bottom line: It may be my own home's circuitry, but I am RMAd the items. 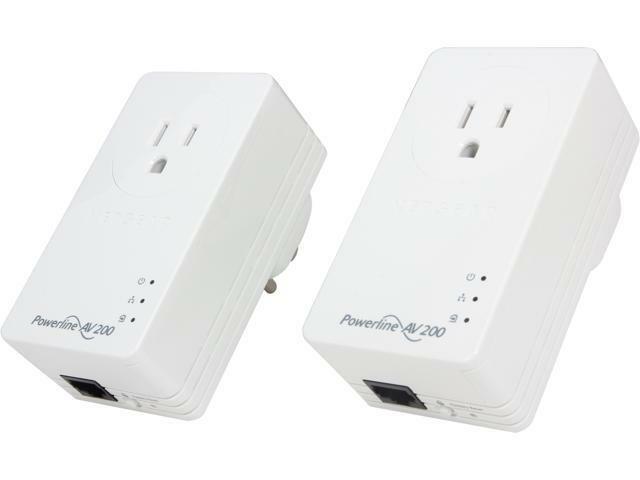 Pros: These powerline adapters work well and are plug-and-play (no setup AT ALL), if you're comfortable forgoing password protection within the powerline network. These adapters are fully compatible with Netgear's other AV 200Mbps adapters. Cons: This adapter DOES not allow plugging any grounded (three-prong) power cord into the other outlet! You can plug an ungrounded (two-prong) cord into the other outlet, but the top of this device intrudes into the ground pin's space in the other outlet. It's a stupid and totally avoidable design flaw, and it probably explains why these kits were selling for under thirty dollars. So the pass-through outlet isn't really a bonus with this stupid product - it's only compensation for the adjacent wall outlet it makes unusable. Pros: I do not own this product, so my rating is just a place holder as I have to put into something. I saw many people complain about hard to setup and have to craw under.out of desk, run over to another room multiple times for the setup. You do not need to do that. You can just plug your adapters to a convenient location , e.g., to a power outlet, next to each other. Once finishing the setup, relocate one of them to your desired place. that's it. 2 out of 8 people found this review helpful. Did you? Other Thoughts: I noticed it gets quite hot and its not as good as a cable cable connection. If your a fan of online games, id get the drill out and a buy nice long Cat-6 Ethernet cable.